Three years since the fall and closure of Jurassic World, Claire Dearing and Owen Grady (Bryce Dallas Howard and Chris Pratt) are called to action to help save the last dinosaurs before a volcanic eruption wipes them off the face of the earth…again. But, not everything is as it seems, and, an even more sinister plan for the dinosaurs may be in the works, only one way to find out…Roar! Directed by J.A. Bayona and written by Derek Connolly and Colin Trevorrow, the DNA in this feature would appear to be strong, but, in actuality the end result is a bit flat. A few predictable chills and spills, plenty of nostalgia laughs and known dino tropes fill in the rest of the simple coloring book of Jurassic lore; we’ve got ourselves a popcorn chomper that does little to reveal more than we already knew, even with semi baked twists in consideration. Chomp chomp chomp, this might serve best as a matinee, better yet a rental later, no rush. 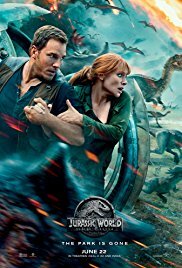 Jurassic World: Fallen Kingdom is rated PG-13. Looking into the life and lessons of the legendary and iconic children’s television host Fred Rogers, Director Morgan Neville offers up this touching, reassuring, and heartwarming documentary. Told from the perspective of several family members as well as fellow actors and crew on the show, Neville helps to paint Rogers as a man who actually walked his talk– effectively communicating, showing love, respecting all, and teaching his philosophies and moral codes with a kind hand. This is the film America needs to see to be reminded of what we CAN be and perhaps how we SHOULD be. Fair warning, at the press screening of this film (imagine a room full of hardened viewers) not a dry eye could be found. This is a must see, and while there is some question as to why not all surviving members of the show aren’t featured in the interviews, the spirit and intent of this film is pure gold. 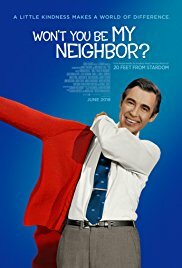 Won’t you Be My Neighbor is rated PG-13. Thirty years later a small group of childhood friends are still engaged in an annual and moderately organized game of Tag during the month of May. And, this might just be the year that Jerry (Jeremy Renner) is deflowered as “it,” you see, all this time Jerry has never been tagged. 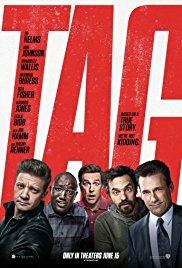 Hogan, Bob, Randy, and Kevin (Ed Helms, Jon Hamm, Jake Johnson, Hannibal Buress) will have to come together as never before, all the while supported by Hogan’s wife Anna (Isla Fisher) and the watchful eye of reporter Rebecca (Annabelle Wallis). Getting Jerry may be one goal; but, there may be a bigger message about Tag than any of these friends ever anticipated. Directed by Jeff Tomsic and written by Rob McKittrick and Mark Steilen this deceptively compelling story about brotherhood tees up irreverent male humor with enough heart and soul to deliver a heartwarming message in a simple package, and, loosely based on a true story none the less. Simple escapism awaits as we roll closer to the Summertime blockbuster season just days away, there isn’t exactly rocket science involved in this slapstick adventure, but rather, enough laughs to cross the finish line in fair enough order, especially with a run time of an hour and forty minutes. Tag is rated R.